Obsolete news: The cover article for the 13 August 2009 issue of Nature published a packing method for tetrahedra with a packing density of 0.782021, a new record. For complex packings, space is divided into an orderly arrangement of identical cells. 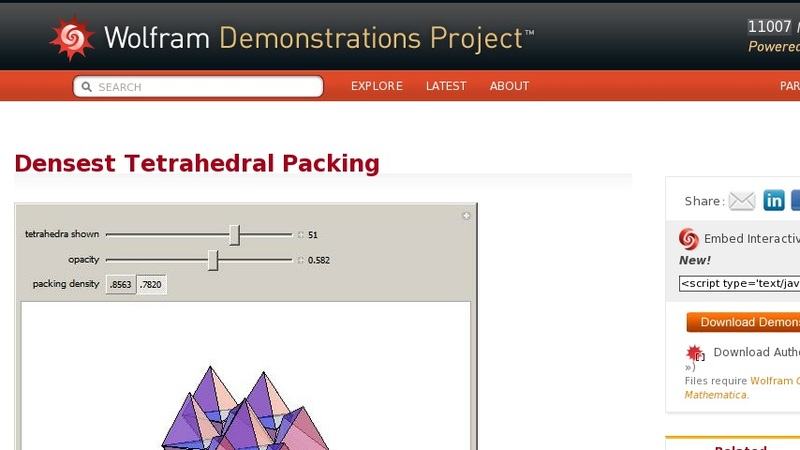 In this packing, each cell has 72 tetrahedra, shown here. The cells of a packing are usually parallelepipeds, but can be any space-filling polyhedron. The objects in a packing can extend outside of the cell, so long as they do not overlap objects in the neighboring cell. The packing density is the percentage of filled space within a particular cell. Updated news: Aristotle mistakenly claimed that regular tetrahedra fill space. 1800 years later (in ~1470), Regiomontanus caught the error. In 1900, Hilbert asked for the densest tetrahedral packing as a part of his ... problem. In 2006, Conway and Torquato published a packing with density 0.7175. In 2008, Chen found a packing with density 0.7820, which was used to make the original version of this Demonstration. In 2009, Kallus, Elser, and Gravel found a quasicrystalline packing with density 0.8547. Torquato and Jiao increased the density to 0.8555. The latest results, as of July 27, 2010, come from Chen, Engel, and Glotzer. There is a packing with density 4000/4671, or 0.856347, shown here. The unit cell has 16 tetrahedra.